Home > Mysteries of the University, Success and Failure	> Wait, What? Congratulations! Based on your interest and success in mathematics here at the University of Maine, you have been nominated for membership in Pi Mu Epsilon. You are cordially invited to join the mathematics honor society and become a lifetime member. 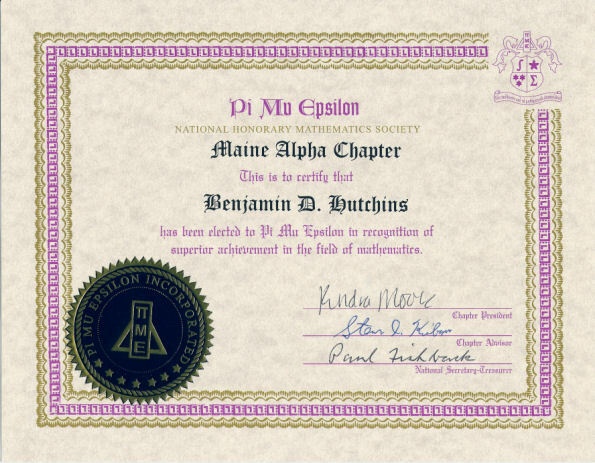 I found this… surprising, since my "interest and success in mathematics here at the University of Maine," to date, has consisted of an A in Precalculus. I do have credit for (and pretty good grades in) Calculus I and II, but they’re from WPI in the early ’90s. I mean, I’m not innumerate, but I wouldn’t have thought of myself as national-mathematics-honor-society material. In fact, I was so puzzled I assumed it had to be some sort of mistake and took the letter to the math department office to say so. I figured it was probably meant for some other Benjamin Hutchins (weirdly, there appear to be three in the University’s computer right now), and he’d be sad if he didn’t get it. Then, satisfied with my good deed for the day, I went on my way. The next week, the math department office staff called me up to say, "Nope, we checked, it’s really for you. Are you in?" Here’s hoping I don’t crash and burn spectacularly in diffy q’s next semester! I wonder if it’s like a gang initiation and they beat you out if that happens. Given that your writing has been out there for twenty-some years, I suspect they may know who you are and be giving it to you for extracurricular activities.